Officials from Britain and Russia are still fighting over who exactly poisoned former double agent Sergei Skripal and his daughter Yulia with the Soviet-era nerve agent Novichok. But whoever did it, one thing is certain: The cleanup is costing a lot of money and labor as the UK combs through every blade of grass that might have been contaminated. As the BBC reports, the Novichok is believed to have been in liquid form and smeared on a door handle at the Skripal family home. But Sergei and Yulia didn’t drop over sick immediately after first contact. They went to a restaurant and were ultimately found unconscious on a nearby bench in Salisbury on March 4th. 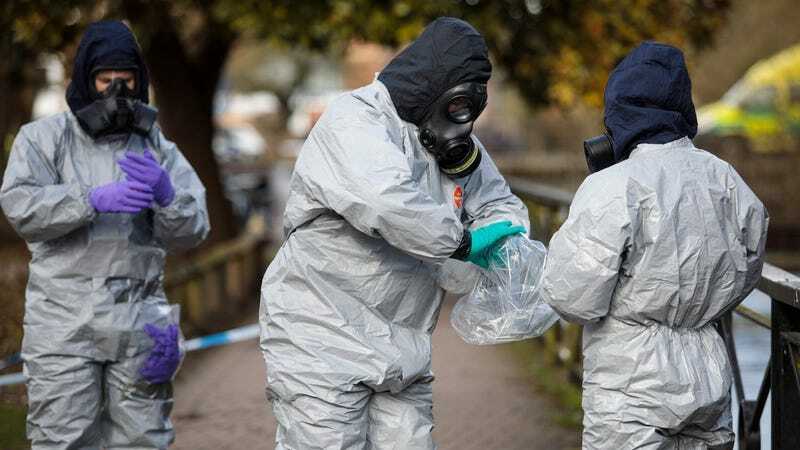 The Department for Environment, Food and Rural Affairs (Defra) said the highest concentration of military grade Novichok nerve agent was found at Mr Skripal’s house, but eight other sites are known, or thought, to be contaminated. Russian officials continue to deny that the country had anything to do with the poisoning of Sergei and his daughter, though much of the western world kicked out diplomats from Moscow in solidarity with the UK. The Kremlin retaliated by kicking out diplomats from those countries as well. Kremlin-backed media continue to float conspiracy theories about the poison, claiming that the UK was actually behind the attack on the ex-spy to make Russia look bad. But no matter who’s telling the truth, it seems that the New Cold War is going to keep chugging along as Russia and NATO-allied countries battle over not just the Skirpal poisoning, but the atrocities in Syria as well.